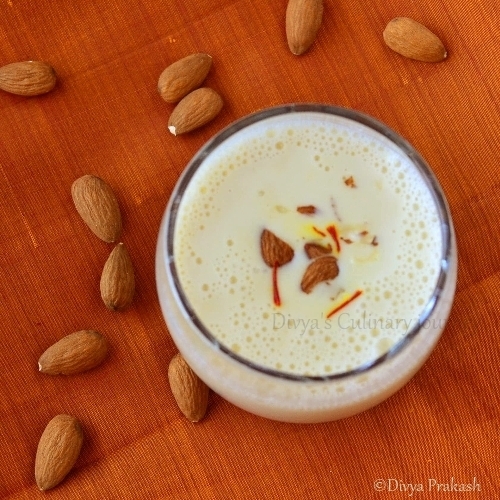 Today's recipe is a simple drink made with Almonds, Badam Kheer. I used to prepare it using ready made mix but never thought about making it from scratch until today. 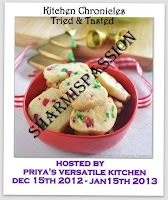 I came across this recipe from Sharmi's passions, it was so easy to make and delicious much better than the ready made mix. Soak almonds in warm water for around 10 minutes and peel the skin of the almonds and grind them into fine paste with a teaspoon of milk and keep it aside. Also soak a pinch of saffron in warm milk and set aside. In a heavy bottomed wide pan, boil milk, add sugar and simmer for 5 minutes. Then add the soaked saffron and the ground paste and mix well and boil it for 3-5 minutes till the mixture starts thickening. Finally add the cardamom powder, mix well and turn off the heat. Garnish with chopped almonds. Serve it warm or cold, based on your preference. Very nice presentation, yummy kheer!!! Yummy healthy drink..Love the presentation..
tempting and delicious drink.have a glass for me. A very soothing drink. healthy and delicious. 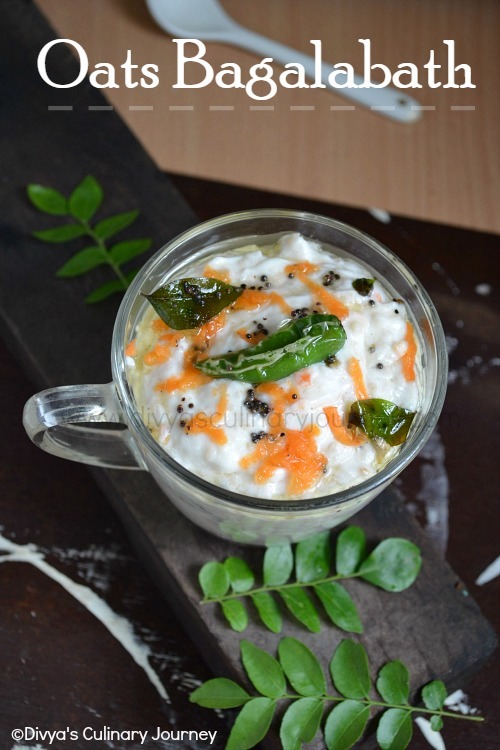 This badam kheer looks awesome! My family loves kheer and I am going to make this very soon. They'll love it! Healthy n delicious drink n my fav too..,neatly presented,love it !! Delicious n healthy drink...luvly presentation. 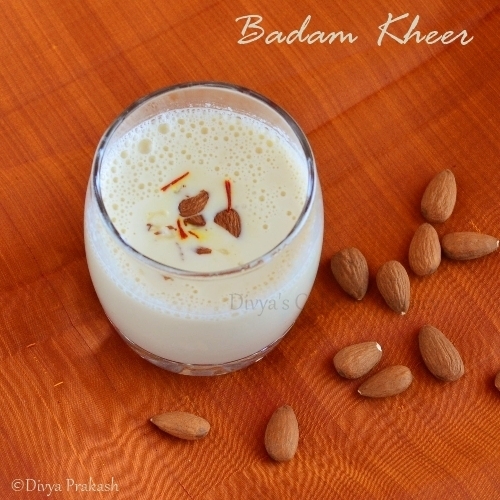 Who can resist to this beautiful drink, love this badam kheer anytime. 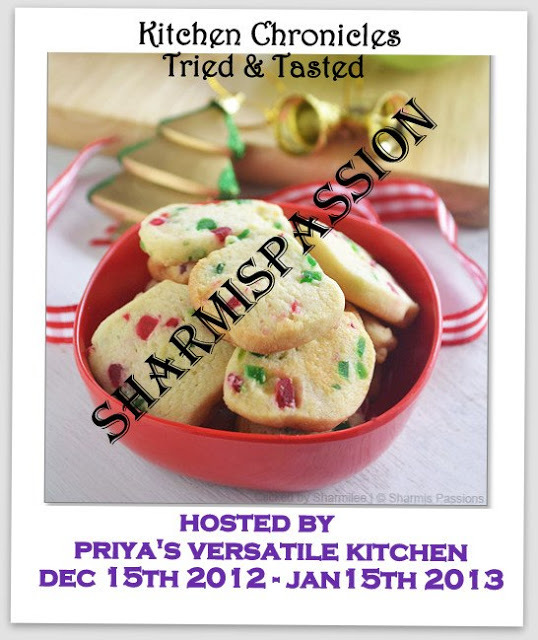 Thanks Divya for sending to T &T event. My all time fav drink dear. Very well done. Home made is always better. I used to drink this when i was pregnant. Wow super tempting and beautiful kheer !! I luv this to have chilled. Luv it. The beverage sound delicious. Why is it kheer when there is no rice in it? Badam kheer looks really delicious...need to try this one..